The California Council of ASLA works to defend your ability to practice landscape architecture in California. Members of ASLAs four Chapters contribute to monitor and advocate legislation on your behalf. We need your help to strengthen and defend licensure. Every four-five years, our licensing authority – the Landscape Architects Technical Committee (LATC), must be re-authorized by the State Legislature and justify that they are necessary to monitor and police practitioners in the field of Landscape Architecture and through their testing of skills and knowledge with the Landscape Architect Registration Examination (LARE) and the California Supplemental Exam (CSE) and the licensing of qualified individuals to provide consumer protection for the public health, safety and welfare. There have been pressures by unlicensed practitioners who have taken the LARE exam and have become licensed in states which do not require degrees in Landscape Architecture to be given the ability to sit for the California Supplemental Exam and be given reciprocal licenses in California. Our industry is also under siege by those who have community college certificates to change the ability of unlicensed practitioners to either take the exam without a degree in Landscape Architecture or to be grandfathered into the California Landscape Architecture Practice Act to provide almost identical services in the practice of Landscape Architecture without having to prove their competency by taking and passing the LARE Exam and the California Supplemental Exam. Please use the Join Us link below to add your name to our Advocacy Team to receive alerts and updates on key legislation and to contact your Legislators and the LATC to defend your licensure. All 50 states have recognized that regulation of landscape architecture is necessary to protect the public health, safety, and welfare. 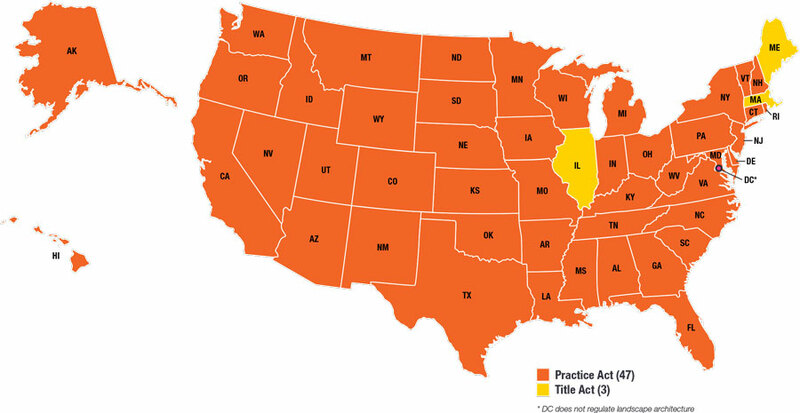 All but three states regulate the profession through a practice act, which requires a license to practice the profession and use the title ‘landscape architect.’ The remaining three states have enacted title act statutes, which is a weaker form of regulation that allows anyone to practice landscape architecture if they call it something else. A practice act is important because of the real danger to clients and the users of these public and private spaces: physical injury, property damage, and financial ruin. Fundamentally, the practice of landscape architecture helps keep the public safe from hazards, protects and maximizes natural resources, and helps prevent damage to public or private property from changes in the built environment. Landscape architects help provide stormwater solutions that effectively manage water to minimize runoff, improve water quality, control erosion, and eliminate safety hazards from standing water/ice. Landscape architects are equally qualified in site design—whether a playground, streetscape, campus, or park—that safely coordinates all uses of a site to avoid injuries and reduce the threat of crime. Landscape architecture helps ensure roads, parking lots, medians and other transportation elements to safeguard driver and pedestrian safety, are ADA compliant, and provide environmental and community benefits. The only way to make sure that landscape architects protect the public in these ways is to license landscape architects. The education, experience, and examination required to earn licensure provide a guarantee that the individual has demonstrated competency in all of the areas that impact the public health, safety, and welfare. States and localities recognize the dangers to the public from the built environment. This is evident not only through licensing, but through building codes and ordinances related to water use, fire, flood, landscape design, and other aspects that can pose a threat to the health and safety of our communities. These codes typically demonstrate the public trust of these communities in licensed professionals, requiring a licensee to oversee and stamp public and private projects that require public approval. Excluding landscape architects from this system only serves to limit expertise and stifle competition for this industry. In the end, less competition means higher fees for these services.